Encouraging civil etiquette is a noble pursuit but it doesn’t belong in park policy. There is a tendency in skatepark rules, much more than with other park attractions, to introduce behavioral rules meant to create “good citizens.” They hardly accomplish this lofty goal, but they do an excellent job of presuming the worst of skateboarding youth. Skateboarders are no more or less likely to need rules governing their behavior than those that play lacrosse, basketball, or chess. The only behavioral rules that are acceptable are those that apply to all park patrons, regardless of the attraction they are drawn to. Many Parks Departments have instituted a park system-wide no smoking policy, for example. Such a policy is within the privilege of the hosting community and, by and large, few people have issues with it. However, a no smoking policy that applies only to the skatepark is an insult to those park patrons and undermine the authority of other facility rules that may be more critical. Rules and signage that presume skateboarding youth are “probably” delinquents are a terrific way to drive a wedge between the skateboarding youth and the rest of the community. How does one “skate respectively?” In spite of the typo, the “rule” to skate respectfully is unenforceable, patronizing, and will undermine the authority of the other more-important rules. Behavioral rules are often unenforceable. A good example is the sign that reminds park patrons, “this is YOUR skatepark.” The subtext is clear even to the youngest skaters; the Parks Department feels that there’s a potential for the skateboarders to utterly destroy the new skatepark because they lack anything resembling pride and ownership. The sign is a “friendly” reminder that they will be held responsible for what occurs there. In reality, this is a passive-aggressive exclamation that skateboarders are unlikely to meet community standards without some encouragement. It is demeaning to the skateboarding community. What everyone really wants is an active, social place where people can come together to have fun. The skaters will need no encouragement to make the place a positive, healthy environment…provided they are given respect and involvement in the skatepark’s development. In some communities the skateboarders are willfully left out of important developmental decisions, then saddled with onerous responsibilities and expectations for the park’s social health. These parks often fail to please anyone in the community, and when the park fails to meet expectations, the victims are the active, dedicated skateboarders from the area. 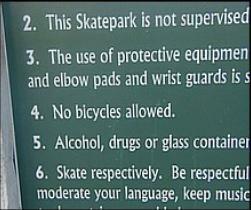 Thankfully, these types of rules are increasingly rare, and usually occur only at skateparks where the local skateboarding community was not involved in the facility’s creation. It’s an easy trap to avoid. The skatepark should not require any special rules that would seem unreasonable at similar athletic facilities.